Hook and loop closure eliminates uncomfortable metal clips or buckles. 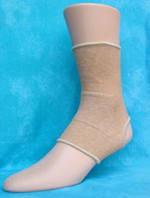 3” width, heavy-duty elastic provides excellent support for sprains, strains, post fracture and conditions requiring orthopedic support. Streamlined construction for extra comfort and increased mobility. Individually boxed. Available in small, medium, large and extra-large. 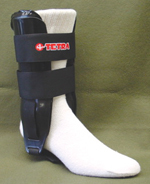 Duck lined with napped flannel creates a strong yet comfortable splint. Preshaped metal stays give support. Foam padded tongue with stays and lace closure. 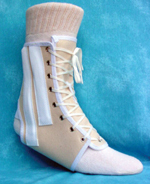 Expansion elastic over achilles tendon for added comfort. Fits male or female. Available in small through extra-large. Order by shoe size, see chart below. SIZE CHART - FROM ANKLE CIRCUMF. Universal Foam/Gel in standard 10” and trainer 9” lengths. Outer shells and straps are black and contain removable foam/gel pockets inside. May be used for hot or cold therapy. Pockets are freezable and microwavable (3 intervals-10 seconds each). 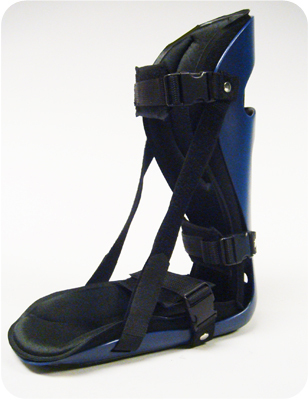 This ankle immobilizer has a semi-rigid, anatomically designed shell that provides protection, comfort and helps prevent inversion/eversion. 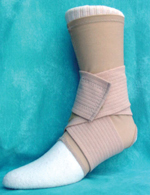 Fixed bladders inside can be inflated or deflated with plastic tubing (included) to conform to the ankle while on the patient. 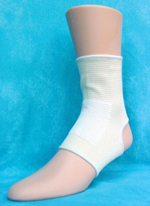 Air cells provide dynamic compression and support for soft tissue, enhances circulation, and reduces swelling. Includes hook and loop closure straps. Self sealing valve can be tucked inside. Fits in most shoes. Wipes clean. Standard 10” and trainer 9” lengths. For adults taller than 5 ft, 4 in. Provides consistent stretch to the plantar fascia, and provides pain relief from plantar fasciitis and Achilles tendonitis. 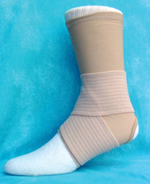 Gentle dorsiflexion positioning provides comfort and allows for healing while sleeping. Slip resistant sole, easy to apply. Fits left or right foot. Lightweight, simple to apply. Gives both ankle and arch support. Eliminates bulk and reduces tape use. No tape on skin to cause irritation. Can be worn during hot/cold treatment. Order right or left styles, extra-small through extra-large. See size chart. 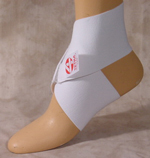 Double strap fits right or left ankle and gives support to arch and ankle. Order extra-small through extra-extra-large. Application suggestions are printed on packaging. To order, measure ankle circumference and see size chart. Also available in black, use item # 1277-B.